It may be less discussed than other conditions that come with older age, but incontinence in women is a surprisingly frequent problem, especially for those going through menopause. Learning more about the disorder can help sufferers and their loved ones feel less alone: read on for five little-known facts that can help along the way. Incontinence in women can seem like an isolating experience, not helped by the fact that many are uncomfortable discussing it with others. The truth, however, is that 13 million Americans suffer from some form of the condition every year, and 85% of them are women. Additionally, statistics skew toward women going through various stages of menopause: more than 40% of menopausal and postmenopausal women report experiencing the disorder. 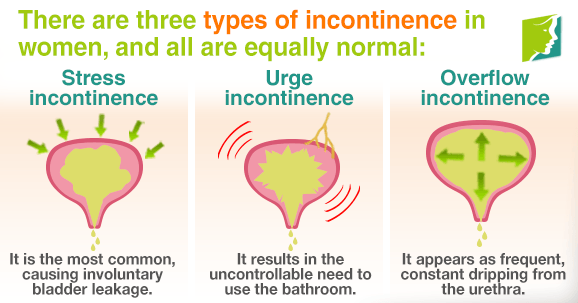 There are actually three different ways in which incontinence in women can manifest, and all are equally normal: stress incontinence is the most common, causing involuntary bladder leakage when coughing, laughing, or exercising; urge incontinence results in the uncontrollable need to use the bathroom more than seven times daily, or more than twice per night; and overflow incontinence appears as frequent, constant dripping from the urethra. It's logical to think that the amount of liquid consumed would have a greater impact on incontinence in women, but what really counts is the quality of these liquids. Dehydration can worsen negative symptoms, so experts still recommend that sufferers drink four 16-ounce glasses of water each day or the equivalent volume - no more, no less. However, caffeine and alcohol should be cut from the diet, since they add to unnecessary liquid intake, have a diuretic effect, and may irritate the bladder. For those who already maintain a healthy lifestyle, incontinence can seem to arise from nothing. Incontinence in women can be hereditary, however, and a genetic predisposition to the syndrome may put some at greater risk of developing it. This may explain, in part, the large numbers who report its symptoms each year, but it does not make it any more difficult to remedy the problem. Though incontinence in women is definitely an issue, simple lifestyle changes are all that most need as a cure. Kegel exercises are the most common prescription, and they make for a simple workout that strengthens the muscles of the pelvic floor and can be performed anytime, anywhere. For those going through menopause, hormonal imbalance may be to blame, and a balanced diet, regular aerobics, and natural herbal supplements can reduce symptoms at the source. It may be less than comfortable to think about, but learning all you can about incontinence in women is the surest way to combat the disorder. Armed with the information above, talk to a healthcare professional today about what you can do differently to find peace of mind and personal relief. Follow the link for further information on how to handle this menopausal symptom. Urinary incontinence is a medical condition that affects a large number of women. Click here to learn about exercises that can help prevent incontinence. Many women suffer from stress incontinence during menopause. Read on to find out which foods are best to achieve relief from this condition. Stress incontinence can get in the way of daily life at any moment, causing anxiety and sometimes embarrassment for its sufferers.